This is a continuing series on ten iOS Tech Tools that can be used to help a secondary music educator prepare for a concert. The idea comes from Amy Burns, who created the idea for this series with a focus on elementary music educators. You can find Amy’s series at mustech.net. I have had to try to find ways to assess students that reflects what they know and what they can do. When it comes to a performance, I cannot grade them individually, as I cannot hear what they are individually doing in the concert. I have to assess them before or after the concert on an individual basis. I don’t have lesson time, and we don’t have funding for red/green note programs. We are a 1:1 school, however, so what I can do is have every student record themselves singing a part of a song during a rehearsal. I used to assess student performance with Showbie (see post #4 in this series), where I would post a rubric in PDF format, and then have students use the embedded audio recording tool to record themselves in class on that document (make sure they know where the microphone is on an iPad or Chromebook—it has moved locations on the iPad in recent years). Then I later used Showbie’s quick grading feature to toggle through each of the sung assessments and to quickly mark the rubric with a finger, stylus, or Apple Pencil. I have about 340 students—and if you choose the right area of a song to assess, you don’t need much more than 15 to 30 seconds of music to ascertain a students’ current level of ability on a song. I stole the idea of using rubrics for this process from a colleague at another 1:1 iPad school in the area (Sue Bujold), and middle schools in our district cannot give a grade lower than 50% on any assignment, even if a student has not attempted the assignment (please do not take this statement as my approval of this approach). If a student missed the opportunity to record in class, they could attempt to record at home (a cappella), or record another day in class, if we were still working on the music. This past concert season, I assessed two songs, along with sight singing and rhythm reading, all in a group setting—it is incredibly efficient, even with a large number of students. You do have to use your prep time efficiently if you want to keep your home life your home life (otherwise you will be grading non-stop at home, something I try to avoid). Last year, my school decided that all teachers would use Schoology, and this year our district provided funds for the enterprise version. The full version of Schoology has an embedded audio recorder, and has rubrics built in. This year, instead of using Showbie for assessments, I have used Schoology…and this works incredibly well. Students record themselves in an assignment, and the assignment is already linked to a rubric (pretty much the same rubric as the past). Grading is just as fast as Showbie, particularly if I grade using a MacBook (and not my iPad). As in the past, students can resubmit recordings, and the minimum grade of 50% still applies. Again, please note that the free version of Schoology does not allow for in-app audio recording. In both programs, I can add specific comments (something I do not always have time to do), and with the 50% minimum, scores may not be what a student desires—but they do not completely destroy the grade, either. As you can see on the rubrics, the categories are “meets expectations,” “partially meets expectations,” and “does not meet expectations.” One of the great joys of this approach is that students have to sing for you, but they do not have to sing alone or in a small group in front of you, which can be absolutely nerve-wracking for some students. In this method, they can sing with their peers, but their microphone (I find about 6-8 inches away from their mouth while singing) allows you to hear how they are doing individually in the safety of the herd. I will be using similar rubrics with video assessments (pointing at the students hands on the instrument) as we move to ukuleles as a primary focus for the next 10-12 weeks. If you are a teacher that has been looking for a way to individually assess student performance in music classes, these technology tools are an incredible way to help you in that process. I have attached some images of the rubrics that I have used in the recent past with both Showbie and Schoology. Last year, my 1:1 iPad School decided to have every teacher use the free version of Schoology. The free version lacks a number of features–and as such, I kept using Showbie in my classroom even as I used Schoology. This year, our district is piloting the full (enterprise) version of Schoology, which has a greater number of features. I am still using Showbie in my classroom–but at a much reduced level. Showbie now calls itself a “light” learning management system. Originally an iPad app (and growing device agnostic year by year–a growing solution for Chromebooks, too), Showbie allows you and your students to share all kinds of documents–as well as to invite parents to see them. You can grade submissions in Showbie using a quick grading tool (I still had to transfer grades into Infinite Campus by hand). If a PDF is used in Showbie, either the student or teacher can annotate the document–which is a wonderful feature (Schoology currently only allows teachers to annotate). Showbie can also accept audio, video, GarageBand, and more file formats. Someone asked how a GarageBand file could be shared by a student or teacher…and Showbie is an option for that. There is a free version of Showbie, as well as a paid version. I have paid for the program for the past three years, with a renewal coming soon. In my early days, students completed worksheets in Showbie, I used Showbie for their music (you can create a folder that only class members can access and upload music–and page turns are left/right and allow for annotation), and I eventually used Showbie for audio and video assessments. I would upload a PDF of a rubric and have students submit audio or video recordings (most recorded in class during an ensemble rehearsal), and later grade them using the rubric. I even had students assess themselves on a rubric (I cannot figure out how to do this on Schoology). I call this methodology a “light” approach to red note/green note software–my friend Paul Shimmons at ipadmusiced.wordpress.com uses SeeSaw and Google Classroom in a similar way. Last year I moved away from having students write answers to daily questions in Showbie (from the S-Cubed Sight Reading Method) and instead used Schoology’s quiz feature (self grading). And this year, Schoology’s enterprise version allows students to submit audio recordings, and rubrics on Schoology work great (we are also using Schoology as a grade book and only copying end of term grades to Infinite Campus, our actual student management system). This year, rather recently, I have temporarily abandoned the written part of S-Cubed (sticking with the content and tasks)…so I am not using any system to grade written work. I am still using Showbie for student music–and it is worth every penny of the annual subscription ($125?). Admittedly, for my current use, I wouldn’t need to pay–but the service is so useful (and we use it with so many students) that I want to make sure we are supporting the company. With Showbie as our music folders, I can easily send out new music, delete music (or an entire folder), and students still can flip left/right and annotate their music. Schoology can’t do that–yet. How do I make sure students are using Showbie instead of messing around on their iPads? That’s a tricky question–but generally the answer is that I use Apple Classroom to monitor their app use. I could look at screens…but I figure if they are in the right app, that’s most of the battle. Some kids doodle throughout the hour on Showbie…but they would be doing the same with paper music. Some readers may wonder why I wouldn’t use forScore, unrealBook, NextPage, Newzik, or PiaScore (free) with my students. There are two reasons. Showbie only allows my students to see their music, turn pages, and annotate. All of the other programs include too many options for my students–they press every button. Cost is also a factor. If forScore is $9.99 (worth every penny), it would cost 50% of that for an educational version of the app which can be withdrawn and reassigned). For my 300+ students, it would cost $1500 to get forScore on every iPad. Showbie is $125 per year. And finally, I love being able to quickly assign and withdraw music from a classroom “assignment” (it is really a folder). No other app has this level of management (although forScore has played with groups and Newzik is working on solutions). I should also add that Showbie is super-simple for students to use and to figure out. It isn’t surprising that Showbie is popular for all grades, K-12 (I don’t know a single math teacher would wouldn’t love Showbie). All of this may change if Schoology offers annotation and left/right page turns in the future. With the enterprise version, our Google accounts work for Schoology–removing a barrier–and Showbie still works with GAFE accounts. The non-enterprise version to Schoology was a mess with e-mail accounts and passwords. Ultimately, what I want to convey is that we are in our 5th Year of 1:1 iPads, and due to external influences, my workflow continues to adapt to both available resources and the expectations of my school/district. If you have the enterprise version of Schoology…try in-class or out-of-class (band/orchestra) use of the audio recorder and a rubric for assessments. And if you are in need of a super-easy solution to digital music (not perfect, as page turns require swipes and there are no “hot spots” to allow for repeats or DC/DS markings) look at Showbie. I am starting to work on a wickedly hard ukulele play along (I&apos;m not saying what it is yet), and I realize that even the best players are going to need to stop and take a look at some of the chord before being successful. Most elementary programs will not be able to tackle this song (on ukulele), but that&apos;s okay…their teacher can play it, or a few of the ukulele superstars can work on it at home. But here&apos;s the question: how can you slow down a YouTube video and maintain the pitch? Or, how can you speed up a YouTube video and maintain the pitch? You can save a video, open it in iMovie, and alter the speed, saving the pitch. But if you don&apos;t want to do all that…YouTube has speed controls with "preserve pitch" built in. Perhaps you knew that already. I did not. I figure that if I don&apos;t know something, there is a chance that others do not as well. As a warning, this would mean that you would need to open the video in YouTube, having internet access, and you may want to prepare ahead of time with a service such as safeyoutube.net that does not show all of the other YouTube "clutter." (And yes, your class will react if they see something on a video sidebar that isn&apos;t appropriate). In fact, it might be smart to share ALL YouTube links as safeyoutube.net links in school settings (regardless of the age of the student). How do you slow down or speed up a video (this also works on safeyoutube.net)? Step 1: Click the "gear" in the lower right hand corner of the screen. Step 2: Choose the "Speed Option"
Can you believe how easy that is? A few of the music teachers that have been making these videos have been doing so with multiple speed formats, which may be helpful if they are trying to download the files locally to use in a presentation (See note below). However…every person watching a YouTube video can take advantage of this feature for any reason. I can see a number of musical reasons to use this feature–ukulele just brought it to my attention. Note: I always encourage presenters, such as at music conventions, to make sure that all of their media is on their device and embedded in a presentation. Never rely on wi-fi at a convention–you have been warned! I wasn’t. I think very few of us do. With that question from the professor, I decided to start including dictation with my choirs, and I have continued to do so over the years at the high school level. Sometimes as much as two times per week, students would take out staff paper (thank goodness for online PDF staff paper sources, such as this site) and I would write out the clef, key, and time signature as well as the first note of an exercise for my choirs to dictate. Then I would play the exercise they were supposed to dictate. Sometimes I would plan this well in advance with Finale, creating JPGs (and even playing the example they were dictating via Finale), and other times, I would just write the exercise on a lined staff board. We certainly didn’t do dictation all the time, but I don’t think there has been a class since that first oral examination where my choirs haven’t been exposed to dictation (rhythmic or melodic). Well, I’m teaching middle school now. Can these kids learn dictation? Yes. And the iPad can help. There are 88 keys on the piano, or 88 different pitches. How many different pitches do you hear? Not only are there different pitches, but there are a total number of notes I am playing for this exercise. How many different notes am I playing over these two measures? You can see that we are using a quarter note, and there are no rests. What other kinds of rhythmic notes are present in this exercise? Afterwards, I put the answer up on the screen. Now, this is a REALLY easy dictation exercise, but most of us dress with our underwear before putting on our pants (unless you are Superman, and if that is the case, why are you wasting time with this blog?). I strongly believe in giving students credit for TRYING to get the dictation right, rather than for being right or wrong. If they are wrong, I encourage them to look at the answer and to ask themselves, “Why did I do this wrong?,” rather than to simply just say, “Oh well,” and move on. Students didn’t start on the right first pitch, even though it was given to them. Students fail to draw the ledger line equidistant to the other lines of the staff. 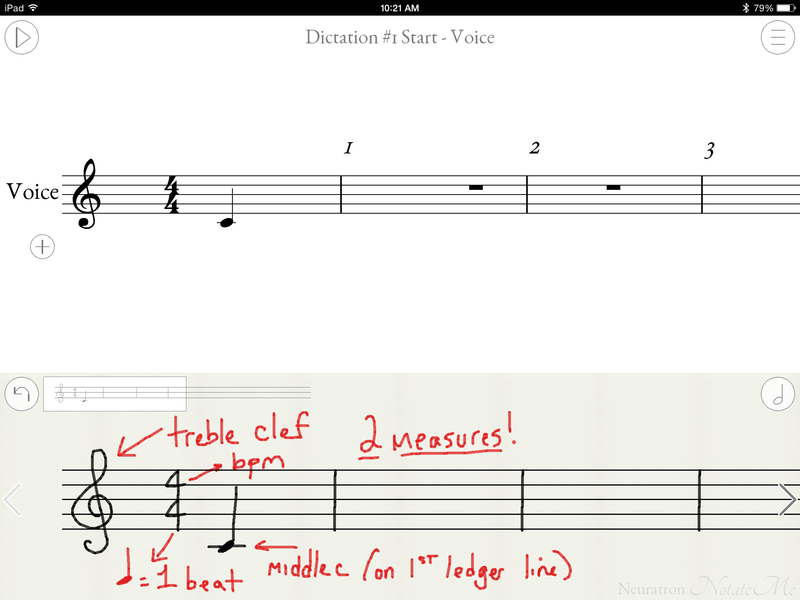 Students draw noteheads that are too large, causing NotateMe Now to interpret individual notes as chords. Students put all 8 beats in one measure. Even though I reiterated that we were using stepwise or same pitch motion (like our sight reading), many students jumped more than a step on the penultimate note. All in all, however, this went incredibly well. A handful of students did not attempt the exercise and did not get credit (these are the same students who do nothing else in choir, which is only a forced elective for them), but otherwise kids bought in to the experience. Middle school kids who normally freaked out every time we did something new actually just went along with the new thing without panicking. Either they are getting used to me and the way I do things, or they are becoming numb to change due to our never-ending Minnesotan winter (seriously–three to six more inches of snow last night. Two years ago, my son was born on March 15th when it was 80 degrees outside). We’ll be doing dictation once every five days in our choirs, meaning once every two weeks. 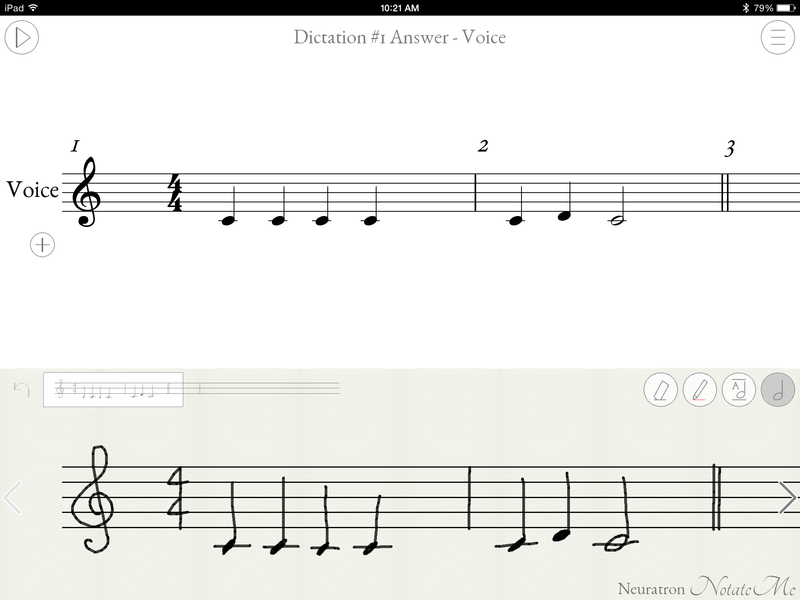 NotateMe Now makes this process much easier…there is no paper to lose or tear, every kid has their iPad, and the app gives them some feedback if they do something wrong (such as too many beats in a measure). As a teacher, you do need the full version of NotateMe (referral link) to be able to use the red pen. One final thought: apps/programs (I particularly think of ScoreCloud) will make notation (even key/tempo/time signature) out of recorded audio…so in some ways technology will make the skill of dictation less critical than it was (and if so few of us teach dictation in our classes, is the skill that critical in the first place?). Still, I think dictation is a great thing to do with students, provided that you make it a non-hostile (i.e. detrimental to their grade) and fun activity (change of pace).